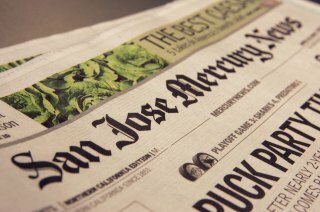 File image of the San Jose Mercury News. The Mercury News of San Jose, California, apologized Friday for an insensitive headline about U.S. swimmer Simone Manuel. The 20-year-old Stanford University student became the first black woman to win a gold medal in an individual swimming event when she tied for first with Penny Oleksiak of Canada in the 100-meter freestyle Thursday night. After the race, the San Francisco Bay Area newspaper omitted Manuel's name in a headline reading "Olympics: Michael Phelps shares historic night with African-American." The Mercury News, which covered Manuel's collegiate career at nearby Stanford, tweeted an apology, saying the headline was insensitive.